My Dirty Kanza prep is coming along nicely. I’ve survived a couple weeks on the road for two major trade shows, Sea Otter in California and Riva Bike Festival in Italy. In both instances, I was able to slip away from the booth to get in a little racing and rode my gravel bike to a third-place finish at the Sea Otter Pro CX race and the Rona Extrema marathon race at Riva that took more than five hours and had nearly 4,000 m of climbing. We won’t talk about the result at Riva, but the ride was good training. When it comes to equipment for Dirty Kanza, the race is a weird because it’s slow, long and has such a stacked field. When I spoke with Dave Sheek, DK veteran and coach of two-time DK champ Amanda Nauman, his words of warning were that you can’t really stop in the feed zones or you’ll lose the group and will have to dig deep to catch back on. To avoid feed-zone stops, I will be using a Camelbak Chase vest with a fresh one waiting at each of the three feed zones already loaded with hydration and food for a musette-style handup. Unfortunately, no feed-zone high-fives and beers will be enjoyed. 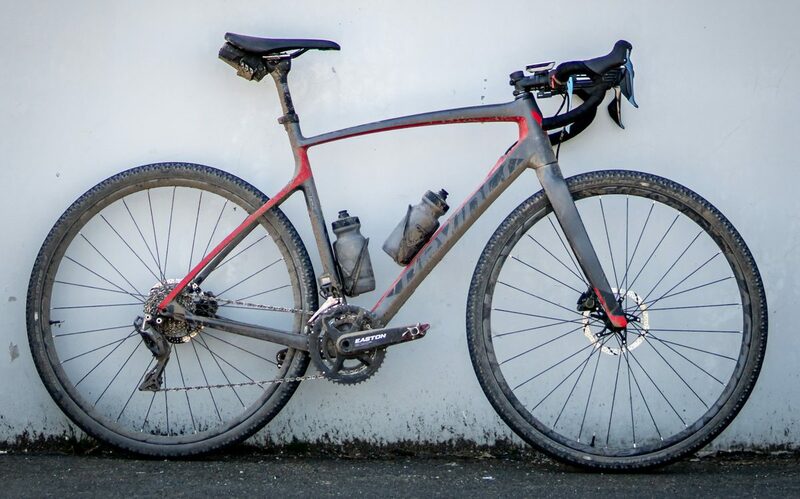 Gear choices around gravel bikes today have a lot of similarities with cyclocross 10 years ago or mountain biking 20 years ago when everyone has different ideas on ideal component selection. People are doing a lot of custom builds. No complaints from me as custom builds are pretty fun. Who doesn’t like to choose every part for the bike? I went with a Devinci Hatchet Carbon frame in a size large. The frame is light, mine was a little more than 1,000 g, has a low bottom bracket for good stability and a compliant rear end as well as a bit taller head tube and slacker head angle. I like how the bike rides; it feels stable and fast. The has Shimano Dura-Ace Di2 shifting and brakes because I figured when I am tired, I will let little motors handle the shifting. The new lever ergonomics are the best of any disc-brake hood shape. Carbon Easton components help to keep the bike as light as possible and to take out road vibrations. I went with EA70 AX wheels because I like the wide rims, but there is a potential wheel upgrade in the works. I have Easton EC90 SL cranks for the lightest and stiffest crank option and the 47/32-tooth chainring set that I have been involved in the testing and development on for nearly a year. The double rings with an 11-32 cassette gives me a large gear range for punching it across gaps and for spinning up climbs when I am on the edge of bonking. I did a fun video around the launch of the new Easton gravel rings and was impressed with the off-road capability of the bike. Tires are always a topic of discussion when talking about gravel and Dirty Kanza. I have had good success with the Schwalbe G-One Allround and Bite tires. But for Kanza, my plan is to go for the G-One Speed 38c tires, assuming it is not wet. I am making a conscious decision to possibly give up a little control to minimize rolling resistance. Tires will be tubeless, of course, with Orange Seal sealant. I will be carrying a Dynaplug for what I hope will make for a fast repair should I flat. The other topic of discussion when talking about gravel and Dirty Kanza is aerobars. I understand their benefits, but they look brutal: even the most amazing bike loses all lust-factor when adorned with a set of clip-ons. As a rider, I generate good power numbers in a time trial position so I would definitely benefit from aerobars, but I can’t bring myself to use them. Also, the aerodynamics of the bike when not in the aerobars is affected. Plus, when you consider the additional weight, they are not an obvious choice. In an attempt to strike a middle ground, I am going to be using a BarYak front mount. I am still working on hand-position modifications. The aerodynamics of the system is good, which allow me to ride in a time trial position relatively comfortably. I’m still dialling in the final details, but I rode my Hatchet with the Chase vest to a hard fought win against my teammate and CX national champ Michael van den Ham at the Ride for Water Gravel race. I need to just get my fitness and nutrition dialled in as well. Then, I’ll be all set to survive the longest race of my life. Craig Richey will take on Dirty Kanza in less than three weeks. Follow the rider on Instagram at @craigrichey and @eastoncycling for more.